Please help us meet the cost of sending out the knitting by sponsoring a sack for £12 so we can continue to send warm clothes and blankets to those in need (especially as the weather is so cold). Show the world how generous you are or dedicate a sack in the name of a friend, a relative or in remembrance. 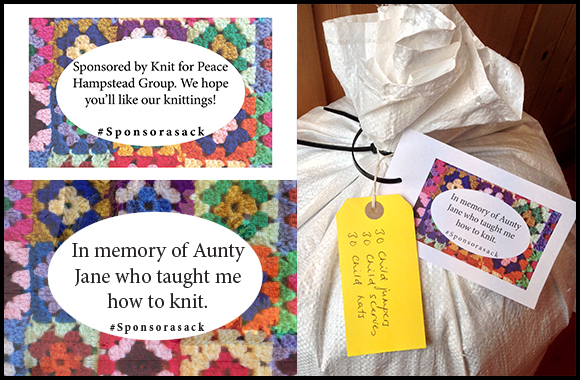 To Sponsor a Sack send a cheque payable to ‘Knit for Peace’ to the address below along with any message you might want, we can take orders by card over the phone at 020 7794 9835, or fill out the form below to pay by Paypal. After clicking ‘Send’, you will be redirected to checkout through Paypal’s website.